This long-awaited short fiction collection contains a variety of voices. “Family is Family” is narrated by a distraught Jewish mother at a PFLAG meeting; “Eggs McMenopause” is told in the voice of a butch in the throes of a mid-life crisis. “Whatever Happened to Baby Fane” explores the friendship of a lesbian and a gay man living with AIDS; “Homo Alone” concerns itself with a lesbian visiting her parents for the first time after her girlfriend leaves her for a man. 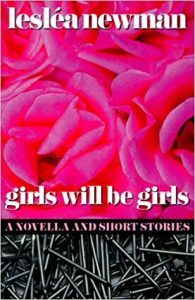 “Girls Will Be Girls” is a novella told in three voices: Gwen, a therapist; Didi, Gwen’s girlfriend; and Nicki, Gwen’s client and the woman Didi is having an affair with. All the stories in the collection are told with the same heart and wit Lesléa Newman has become famous for. Times are getting tough for a loud, proud, Jewish fag hag like moi. My friends are dropping like fruit flies, as Fane used to say. Yes, used to say, for my beloved Fane has left us all in the dust for that Great Back Room in the sky. Fane. I first met him a year before his untimely demise at an open poetry reading held at Queers-R-Us, our local coffee shop/ hangout/pick up joint. Ours is a small community where everyone knows everyone (and more than likely has slept with everyone) so I noticed him right away. His hair fell to his shoulders in thick black ringlets not unlike my own (later we found out we’d both gone through a “Jew-fro” stage at the exact same time). He was wearing perfectly pressed black jeans (which he admitted, when asked, were dry cleaned), cowboy boots, and a black T-shirt that said, “I Survived The Bronx.” Being a born and bred Brooklyn girl who has never been short on chutzpah, I promptly introduced myself. “I’m Missy,” I said, extending my hand. “Fane,” he replied shaking it, which inspired me to slide the top of my jersey off my shoulder in a “Flashdance” sort of way and burst into song: “Fane! You’re gonna live forever. You’re gonna learn how to fly.” Fane laughed, a deep, scratchy, throaty, big-enough-to-live-in laugh, and I was, as they say, smitten from day one. “Sit, sit, tateleh, I’ll buy you a cawfee,” I said in my best Brooklynese, but Fane had other plans. One of the poets, a tall, dark handsome lad built like Michaelangelo’s David, was the sole reason Fane had just sat through three hours of Allen Ginsberg wanna-bes, so if anyone was going to have the pleasure of his company for the rest of the evening, it certainly wasn’t going to be me. “I’ll cawl you,” Fane promised, matching my New Yawk accent vowel for vowel. He wrote my number on a napkin, stuffed it into his back pocket and went off to pursue the stud of his dreams. I didn’t really mind though. I was sure Fane would call, and he did, the very next day. “I’ll take that cup of coffee now,” he said in a weary voice that let me know he’d been up the better part of the night and could really use it. “C’mon over,” I said, putting some water up to boil. Fane arrived in a T-shirt that said, “Start Your Day With Me,” and asked for a grand tour of the house. I showed him my meager digs: a small living room, kitchen and tiny bedroom. “Is this the closet?” he asked, opening the door without waiting for my reply. He took a step inside and started moving my clothes down their rack like a housewife at Macy’s Close Out, looking for the ultimate sale. “Nope, nope, unh-unh, no….” He moved my blouses, pants and the occasional skirt aside until his eyes lit up. “Now this is perfect,” he said, lifting up a silver lame mini-dress I bought on a whim and hardly ever wore. “Wait, it has matching mules.” I dug through my Imelda Marcos-sized shoe collection until I found the three inch heels. Again Fane feigned shock. “I don’t want to wear them, Missy. I want you to wear them….” this time Fane paused dramatically, “…to my funeral.” And that’s how I found out Fane had AIDS. He had left New York City for our small seaside town because he was looking for a quiet place to live. And a quiet place to die.